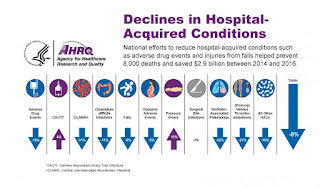 From 2014 to 2016, rates of hospital-acquired conditions (HACs) fell by 8% percent, according to new data from the Agency for Healthcare Research and Quality (AHRQ). This decline translated to saving about 8,000 lives and $2.9 billion in healthcare costs. Examples of HACs include adverse drug events, catheter-associated urinary tract infections (CAUTIs), central-line associated bloodstream infections (CLABSIs), pressure injuries and surgical site infections (SSIs). 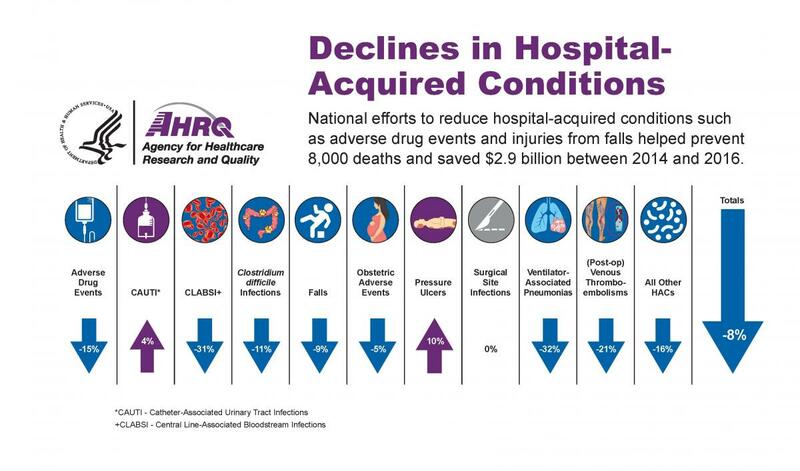 The "AHRQ National Scorecard on Hospital-Acquired Conditions" estimates that 350,000 HACs were avoided during the 2014 to 2016 period. This builds on previous gains made between 2010 and 2014, during which an estimated 2.1 million HACs were avoided. The most significant percentage declines from 2014 to 2016 were seen in ventilator-associated pneumonias (-32%), CLABSIs (-31%), post-op venous thromboembolisms (-21%) and adverse drug events (-15%). Despite these improvements, and the impressive overall improvement, there were some concerning trends. Pressure ulcers and CAUTIs increased from 2014 to 2016 at rates of 10% and 4%, respectively. SSIs remained unchanged. The Centers for Medicare & Medicaid Services (CMS) has established a goal of reducing HACs by 20% percent from 2014 through 2019. If the reduction goal is met, AHRQ projects that during 2015 through 2019, there would be 1.8 million fewer patients with HACs, which would result in 53,000 fewer deaths and $19.1 billion in healthcare cost savings.